Moses Eugene Malone (March 23, 1955 – September 13, 2015) was an American basketball player who played in both the American Basketball Association (ABA) and the National Basketball Association (NBA) from 1974 through 1995. He was a member of the Naismith Memorial Basketball Hall of Fame. 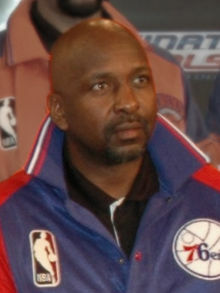 Malone played for the Buffalo Braves (1976), the Houston Rockets (1976-1982), the Philadelphia 76ers (1982-1986; 1993-1994), the Washington Wizards (1986-1988), the Atlanta Hawks (1988-1991), the Milwaukee Bucks (1991-1993), and the San Antonio Spurs (1994-1995). He was a three-time NBA Most Valuable Player. Malone died suddenly from heart disease in Norfolk, Virginia at the age of 60. ↑ "Three-time NBA MVP Moses Malone dies at age 60". ESPN.com. Retrieved September 13, 2015. This page was last changed on 21 September 2015, at 23:27.